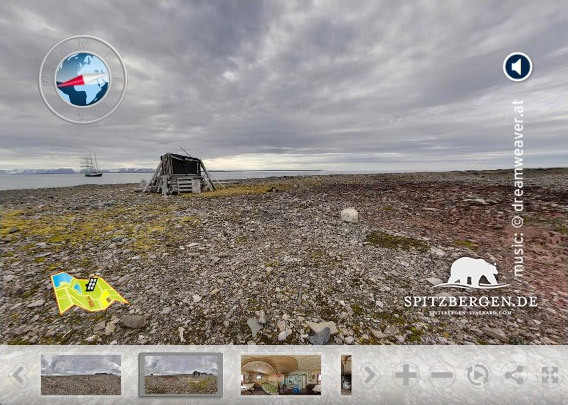 Take a virtual tour: Ritter hut / Gråhuken. Enjoy looking, we appreciate your feedback. 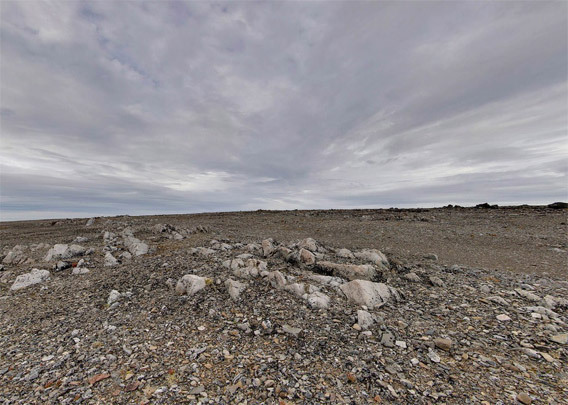 The name Gråhuken is storytelling: a grey flatland, stony and barren, sticking out into the Arctic Ocean between Woodfjord and Wijdefjord on the north coast of Spitsbergen. 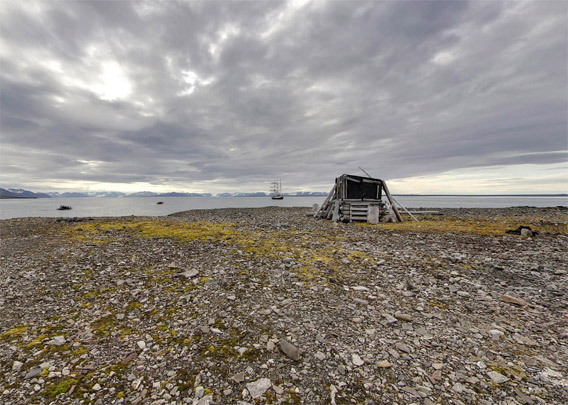 There does not seem to be much alive there, but nevertheless the famous Norwegian trapper Hilmar Nøis built a hut here in 1928, which he called Kapp Hvile (Point of rest or silence). A nice name, but it is only a silent place in good weather. 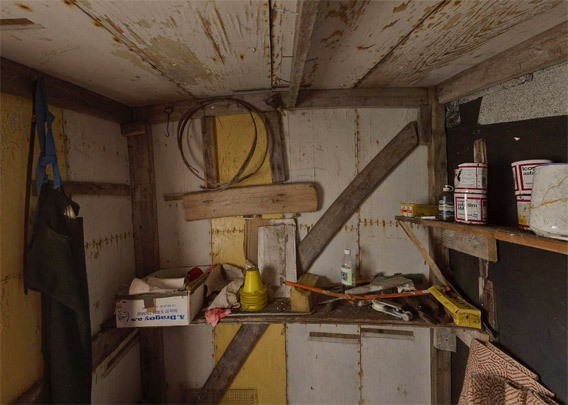 It seems strange to build a hut at such a barren coast, which is only accessible in good weather and sea conditions. The reason was most likely that Hilmar expected good hunting conditions for polar bears here, on the north coast, close the drift ice in spring. Access to drinking water must also have been difficult at least in the late summer, but this was not the time which was important. If a trapper was at all in his arctic hunting grounds at that time of the year, then he could, at least for a while, move somewhere more favourable. A few kilometres south of his hut at Gråhuken, Hilmar Nøis had another one at Vårfluesjøen, with direct access to a river and a big lake. 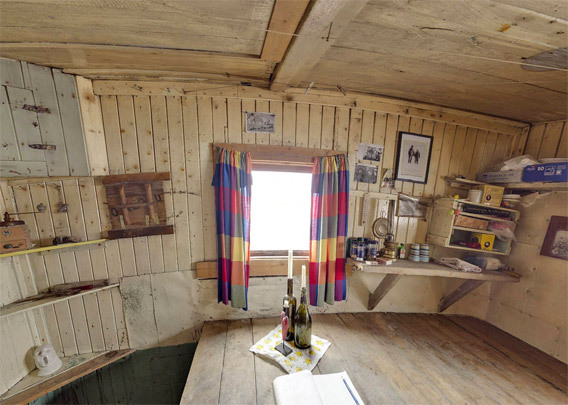 The hut’s claim for fame was a wintering in 1934-35, when Christiane Ritter from Austria spent a winter there together with her husband Hermann Ritter and the Norwegian hunter Karl Nikolaisen. Hermann had already a reputation as an experienced arctic hunter, but it was the first (and last) wintering for Christiane, who later published her memories in a book that became a classic, titled “A woman in the polar night” in English and „Kvinne i polarnatten“ in Norwegian. This side room was used for storage. Hermann Ritter and Karl Nikolaisen built a small room (“Kämmerchen”) for Christiane Ritter, so she could enjoy some privacy, but this must have been a separation inside the main room, which was later removed. Thank you for this great visual tour. I am reading Christiane Ritter’s book right now and it is great to see where her adventure took place. It’s amazing she spent a whole winter in the hut. It doesn’t look very well insulated. Is that the original stove? Hi Danielle, thank you for your comment. No, the stove is not original. They don’t last that long, given that it was common to use driftwood as heating material. The salt destroys the metal rather quickly. But the original one was certainly quite similar.